Exclusive to the 6155R Tractor, the optional rear drop axle provides additional crop clearance under the axle as well as additional drawbar clearance, when compared to a base axle with high clearance tires. The drop axle features a flanged-type axle end that provides up to a maximum drop of 295 mm (11.6 in.) 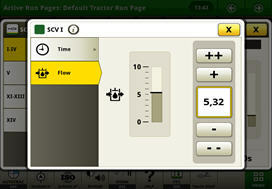 and can accommodate tread settings from 1524 - 2235 mm (60 to 88 in.). 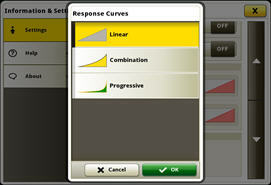 The hi-crop option is only compatible with 18.4R38-in. 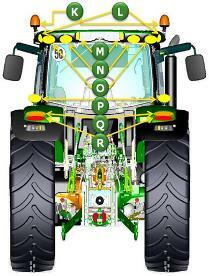 141A8 R2 rear and 320/90R46-in. 148A8 R2 radial front wheels and tires or 320/90R50-in. 147A8 R1W rear and 320/90R50-in. 147A8 R1W radial front wheels and tires. 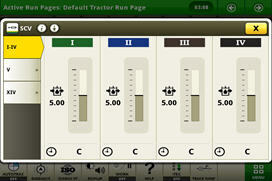 Loaders are not compatible with this configuration. 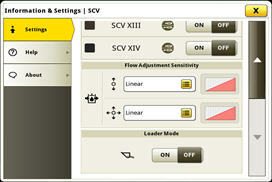 ComfortView cabs feature a modern, automotive-style instrument panel as base equipment. 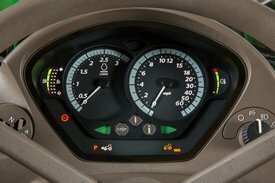 The instrument pod has two large analog dials for engine and tractor speed, as well as two smaller dials that display fuel level, DEF level, and coolant temperature. 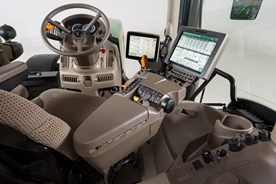 The steering column and dash are adjustable to suit the operator's needs. The column tilts toward the operator and a lever on the left-hand side allows for the column to telescope out to the desired level. 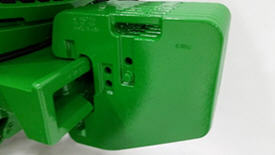 Mechanically actuated valves are controlled by traditional levers, while electronically actuated valves are controlled by fingertip paddle pods. 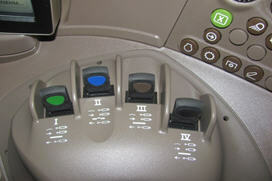 Controls for the ComfortView cab are grouped by function on the right-hand console. 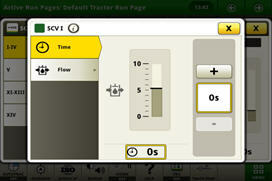 The console is also the location of the CommandCenter. 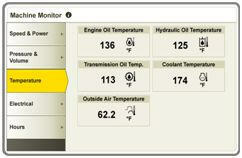 The CommandCenter allows the operator to customize important tractor functions. Grammer is a trademark of Grammer Aktiengesellschaft Joint Stock Company. 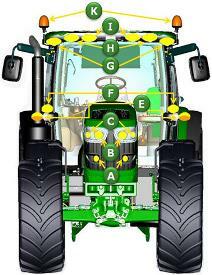 Lights on the 6R Series Tractors have been positioned and designed to provide maximum visibility to the front, sides, and rear of the tractor to increase productivity in any operating condition. The cab lighting pattern provides 330 degrees of coverage while the hood lighting provides the remaining 30 degrees, for completely programmable, 360-degree, stadium-style lighting. NOTE: Please also see available attachments. 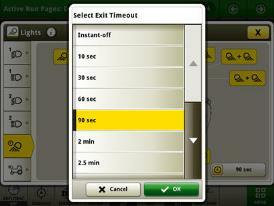 The CommandCenter allows operators to customize two different light programs. 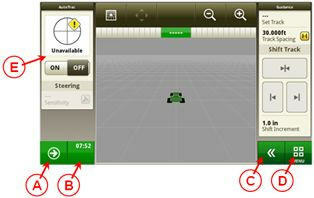 The operator can switch between the two programs with the push button. 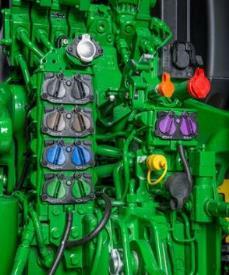 Also standard on the 6R Tractors is the battery power-saver feature. 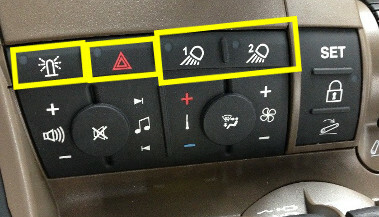 When the engine is off and the outside lights have been left on, this feature is designed to avoid battery run-down. After the lights have been left on for 30 minutes and the key is in the off position, the lights will cycle, or blink on and off, five times as an alert. 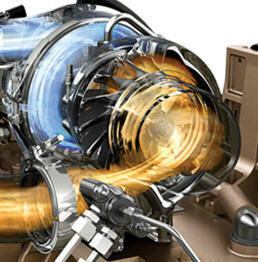 The lights will continue to illuminate for one more minute and then automatically shut off to protect the battery. Optional LED lighting technology provides better depth perception and pattern recognition as well as a natural low temperature light for excellent definition of the field. One LED light will out-live 200 or more incandescent lights, 55 or more halogen lights, and 14 or more HID lights. Beltline and rear fender work lights provide options for full light flexibility, giving flood illumination exactly where the operator needs it. 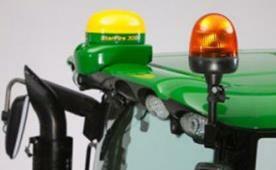 The John Deere beltline lights are available with HB3 work lights and LED work lights. 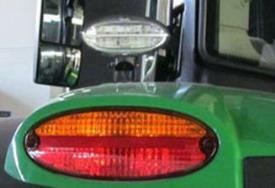 The two rear fender lights are available in HB3 or LED. 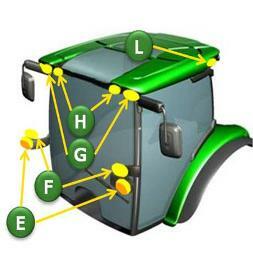 The John Deere lighting components have undergone numerous vibration testing procedures to ensure a good lighting performance and sturdiness under all conditions. 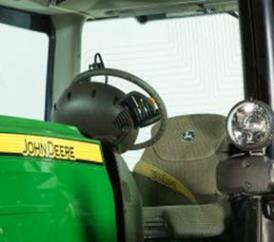 All work lights and beltline lights are adjustable to a desirable angle. 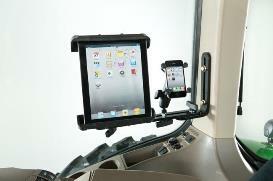 Less eyestrain on approaching traffic when traveling on the road. 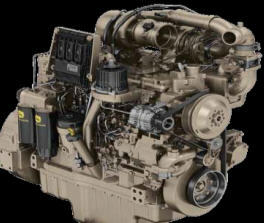 Saves the operator on service time and money and minimizes downtime. 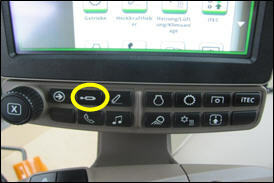 The LED bulbs and diodes have an outstanding operational lifetime to last the tractor's full running lifetime, thus giving the operator greater uptime. Mounted at beltline at front of cab. No hanging work lights are possible. Not in combination with second beltline lights (873M and 873O). 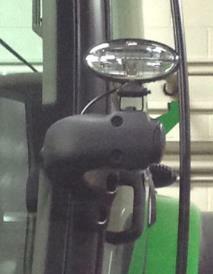 The two beltline lights provide greater illumination toward the front wheels of the tractor. No hanging work lights are possible. Not in combination with second beltline lights (code 873M and 873O). 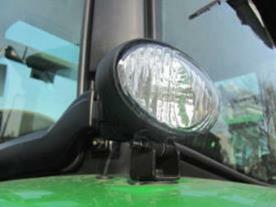 The LED rear fender light adds extra lighting when operating implements close to the ground. NOTE: These lights should not be operated during road transport. 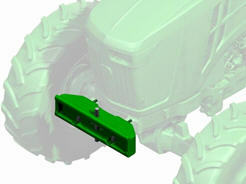 The two rear HB3 work lights, ensure good performance for the cost-sensitive producer. 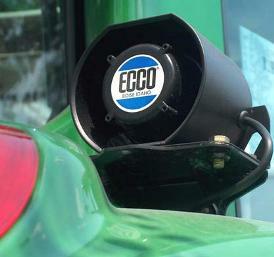 A beacon light is mounted on the front of the cab to provide a rotating warning light for road traveling and added visibility. Easily removed with no tools required when approaching height restricted areas. The beacon has a degree of flexible movement, are not completely static, and can withstand the impact of objects such as tree branches. 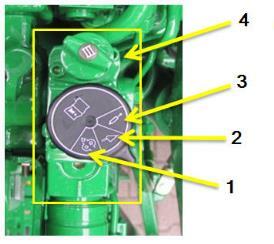 The optional cold-start packages are recommended for producers who frequently start tractors below -6 degrees Celsius (20 degrees Fahrenheit). 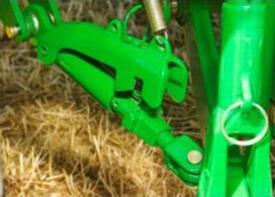 Factory-installed stabilizer bars are recommended for applications such as scraping where high lateral load forces are placed on the hitch. 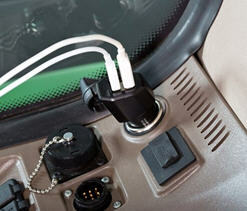 Stabilizer bars work to prevent breakage of lower link sensors. 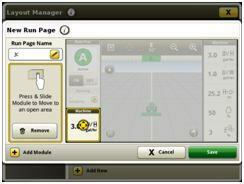 When ordered, regular sway plates and blocks will not be installed. 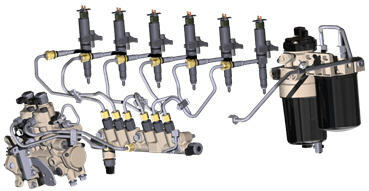 An adjustable stabilizer bar provides positive control of lateral sway when using mounted equipment. 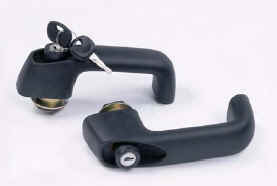 For those who desire both left-hand and right-hand stabilizers, order quantity of two or code 8763. 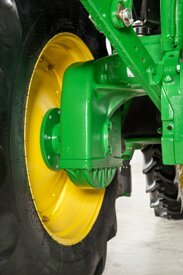 For operators needing front ballast for heavy rear implements, a front weight support will hold up to 18 Quik-Tatch weights to help provide additional weight at the front end of the tractor to increase traction and stability. 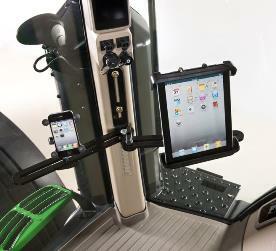 Each Quik-Tatch weight weighs 43 kg (95 lb) and fits on the front weight bracket. 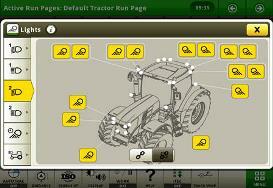 Ballasting requirements for each tractor are found in the operator's manual. 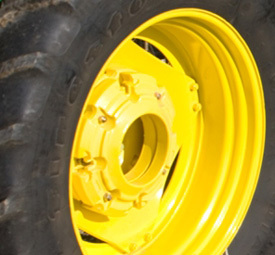 Reference the rear-wheel weight compatibility chart before ordering weights for 6030, 7130-7230, 6030 Premium, 6D and 6E Premium Series Tractors. 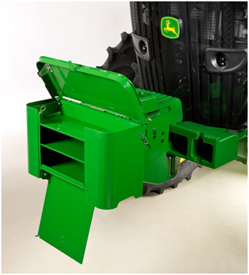 The Field Office for ComfortGard™ cab tractors is designed to store a laptop computer, cellular phone, papers, calculators, or writing utensils and many other small items. 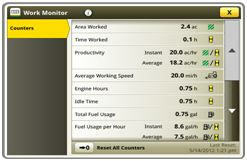 This unit makes a complete office away from the home to improve efficiency in managing farm operations. The lid is a flat surface, and it provides an ideal place for writing. The entire Field Office is removable, so it can go with the operator wherever they desire, and the Field Office base is equipped with a three-pin electrical power source, unless ordered with optional refrigerator (6030 Premium Series only). 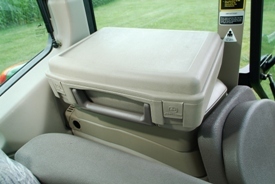 The handle locks case in position, and an optional cup holder is incorporated into the Field Office base. 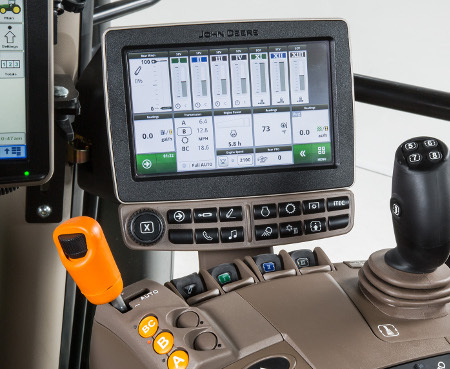 For 6030 Series Premium Cab Tractors, the Field Office can be ordered with an optional refrigerator, both as a field-installed attachment, and as a factory-installed option. NOTE: Field Office with cup holder is not compatible with the instructional seat. 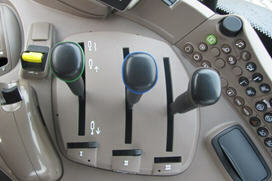 Due to the special configuration of low-clearance cab tractors, this attachment will not be factory-installed. 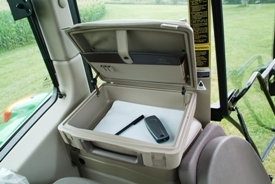 The Field Office for ComfortGardTM cab tractors is designed to store a laptop computer, cellular phone, papers, calculators, writing utensils, and many other small items. 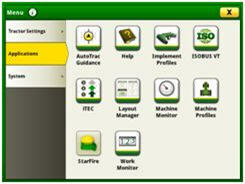 By providing a complete office away from the home, this unit improves efficiency in managing farm operations. The lid is a flat surface, and it provides an ideal place for writing. 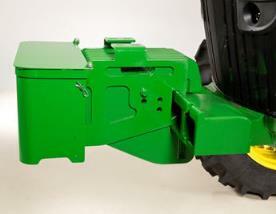 The entire Field Office is removable, so it can go with operators wherever they desire. 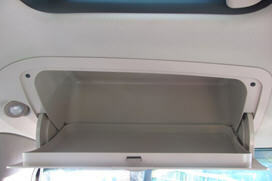 The Field Office base is equipped with a three-pin electrical power source, unless ordered with the optional refrigerator (6030 Premium Series only). The handle locks the case in position, and an optional cup holder is incorporated into the Field Office base. 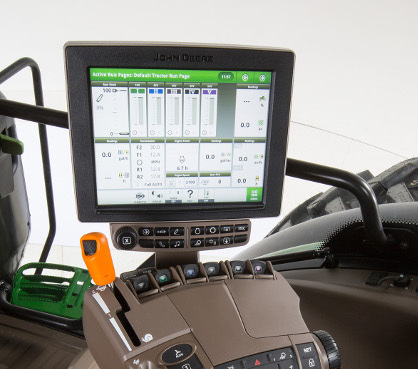 For 6030 Series Premium Cab Tractors, the Field Office can be ordered with an optional refrigerator, both as a field-installed attachment and as a factory-installed option. 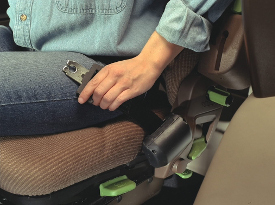 The seat belt kit is a convenience kit for replacing the retractable clasp belt as well as the receiver-clip portion of the safety device. Over time, all seat belts (regardless of manufacturer) undergo wear and should be replaced for maximum safety. Signs of wear include, but are not limited to: fraying or torn fabric belts, excessive oil/chemical breakdown of materials (from body oils, dirt, and other contaminants), corroded or rusted clasp, or a sticking or cracked receiver clip. 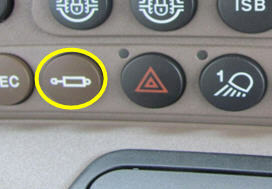 Some wear is not visibly seen, and there may be an interval recommendation for changing the seat belt in the operator’s manual. A seat belt should be worn by all operators and passengers at all times. 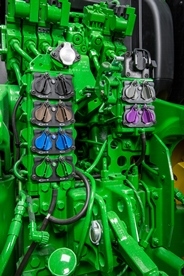 This seat belt kit fits operator and instructional seats for a large number of 5 through 8 Series Tractors. 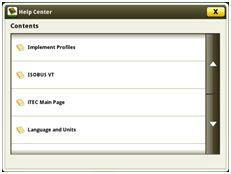 Please reference the parts catalog for compatibility. 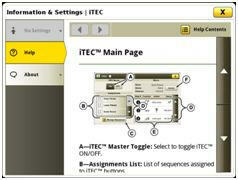 To better accommodate governmental or commercial sales, a back-up alarm is available as a factory- or field-installed attachment on select models. 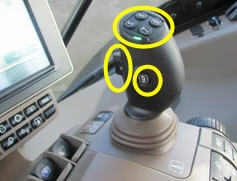 An alarm sounds whenever the transmission is placed in reverse providing a high level of warning that the tractor is changing direction. 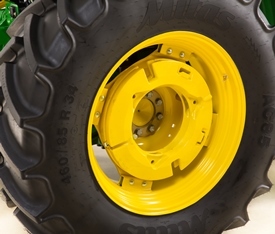 Rear-wheel weights of 110 lb can be installed for improved traction and/or ballast. 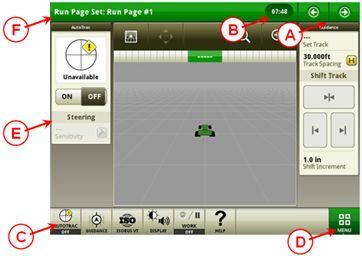 See the section on ballasting and optimizing performance or the the tractor operator's manual for additional ballasting information.